What is a P-N Junction DIODE? A Diode is a unidirectional device permitting the easy current flow in one direction but resisting the flow in opposite direction. A semiconductor diode is simply a P-N junction with connecting leads or terminals on its two sides. P-N junction is also called the crystal diode because it is grown out of crystal. A P-N junction may get open circuited or short circuited and the best instrument for testing a P-N junction is an ohmmeter. 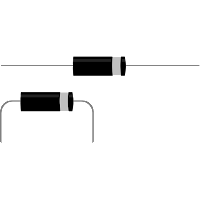 An ideal P-N junction diode is a two terminal polarity sensitive device that offers zero resistance, when it is forward biased and infinite resistance if reverse biased. So the diode conducts only in forward biasing condition. How a P-N Junction Diode works? The current through the diode will be in bipolar in character, because it is made up of both positive and negative charge carriers and the total current is same throughout the device, but the proportion of current due to holes and that due to electrons varies with the distance. There are two mechanisms by which the breakdown can occur at a reverse biased P-N junction. The breakdown phenomenon is reversible and harmless so long as the safe operating temperature is maintained. When a P-N junction is switched from forward bias to reverse bias, the stored excess minority carrier charge must be removed from the junction. The time required to remove this charge is called the storage time and it is a limiting factor in the speed of switching a diode. Can be used as rectifier in DC Power Supplies. In Demodulation or Detector Circuits. In clipping circuits used for waveform generation. As switches in digital logic circuits.